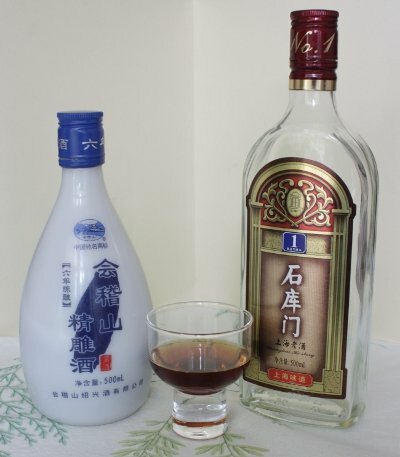 Several years ago I was visiting Shanghai a couple of times a year and I read about a famous local drink from the Shaoxing area of China, just south of Shanghai. I became very interested in this drink becoming more and more curious. It was a drink made from rice and a local koji that was more than just Aspergillus oryzae but also Rhizopus and lactobacillus as well as yeast and wheat or barley flower. My colleagues, not being drinkers were unfamiliar with the drink but agreed to locate some for me. They got me the bottle on the left in the above picture. When I tasted it, it was vary salty and I wondered whether this was meant for cooking rather than drinking but my interest waned over time. However, this would not be the end of it. Recently, I was again in Shanghai and was having dinner with a couple of colleagues. One of them was looking at the wine menu and asked: yellow wine? What is yellow wine? Bing, bing, bing, bing… my mind lit up! Yellow wine, I know what that is, I was recalling Shaoxing’s famous drink; made in a similar way, but different to sake. I explained the little bit that I knew about Shaoxing’s yellow wine. Getting no help from the staff I chose one pretty much at random to try. Two of us gave it a try, it was very similar to sherry and it did not last very long. A small 500ml bottle does not go a long way between two people. Later that night I realized that I had made a mistake in not keeping the bottle to show others, for example you. Now, realizing how to find it, I looked for it at the next dinner and there it was on the wine list. This time it was under Shaoxing wine rather than Yellow wine but there it was none the less. Having a little more experience I chose another bottle, still mostly at random I chose: Shi ku men No. 1 Red Label. This is the bottle on the right side of the picture above. This time we had several more people try it so it again did not last, but I did keep the bottle as you can see. Shi ku men was very similar to what we had the night before, very sherry like. Interestingly enough, there is always speculation about how sake making developed and how much impact China had, based on its own traditions. Yellow or Amber wine goes back farther than does sake so it is reasonable to believe that the original ideas or some of the refinements came from China. Even the early Japanese Wo people of Japan may have originated in China from the Kingdon of Wu. Incidentally the Kingdom of Wu was just north of Shaoxing.